We go through a lot of prototype PCBs, and end up with lots of extras that we’ll never use. Every Sunday we give away a few PCBs from one of our past or future projects, or a related prototype. PCBs are made through Seeed Studio’s Fusion board service. 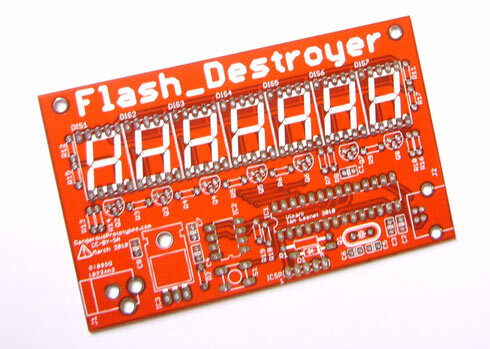 This week we’re giving away two Flash Destroyer PCBs. The Flash Destroyer is our new project that writes and verifies an EEPROM until it burns out. The Flash Destroyer is currently streaming live here, and has reached nearly 11million write-verify cycles. When do you think it will die? You can get a Flash Destroyer kit for $30, including worldwide shipping at Seeed Studio. First come, first serve. If we can’t contact the first commenters we move down the list, so you could consider making a request even if it looks like all the PCBs are gone. This entry was posted on Sunday, June 6th, 2010 at 6:00 pm	and is filed under Flash Destroyer, Free PCBs. You can follow any responses to this entry through the RSS 2.0 feed. You can skip to the end and leave a response. Pinging is currently not allowed. Good addition to my DP collection! Please, I want one ! oh please! i want one too! If there is one left… Please.